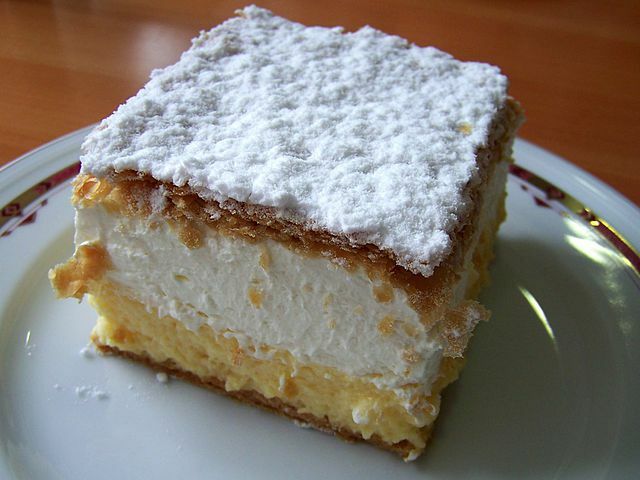 This recipe for Serbian meringue slices or sampita (SHAHM-pee-tah) is similar to Serbian custard slices or krem pita, except the thin dough layers are filled with sweetened egg whites instead of custard. This recipe traditionally is made with homemade pastry, but store-bought puff pastry is perfectly acceptable. The trick is in preventing the pastry from puffing up too much. The Serbian word pita means "pastry dough" and has nothing to do with Middle Eastern flat bread. Check out these other ways to use leftover egg whites. Heat oven to 400 degrees. On a parchment-lined baking sheet, sandwich a puff pastry sheet, that has been pierced throughout with a fork, between two cooling racks. This will keep the pastry flat but still flaky. Bake 15 minutes or until golden. Cool completely. Repeat with second puff pastry sheet. Let cool completely. To make the meringue filling: In a medium saucepan, boil sugar and water without stirring until thick and syrupy, about 6-7 minutes. Be careful not to touch the crystalized sugar on the sides of the pan with a mixing spoon and stir it into the syrup because it would make the syrup grainy. In a stand mixer or heatproof bowl, beat the egg whites until stiff and very slowly pour the hot sugar syrup into the egg whites, beating constantly. After all the sugar syrup has been added, beat for another 5 minutes. Immediately pour the filling over one of the pastry layers. Place the other pastry layer on top and let it cool completely. Then refrigerate until ready to serve. For easier slicing, use a damp serrated knife. Cut into rectangles. Dust with confectioners' sugar.